We first had a glance at QNAP QBoat Sunny at CES 2017. 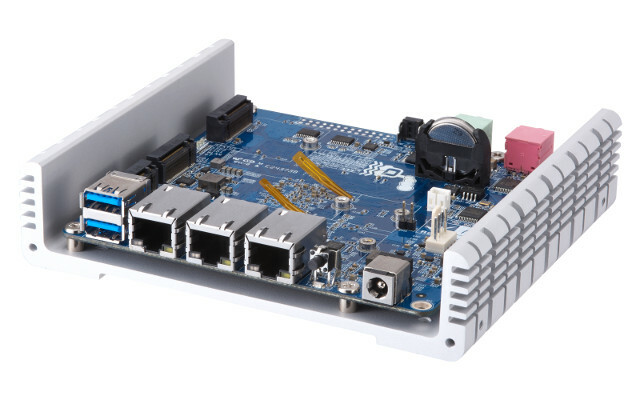 At the time, QNAP IoT development board was powered by an Intel AnyWAN GRX750 dual core Atom based processor with 2GB RAM, 4GB flash, three Gigabit Ethernet ports, some mSATA slot and so on. The company has now officially announced the board, but with a twist, as the Intel processor has been replaced by Annapurna Labs (now part of Amazon) AL-314 quad core ARM Cortex-15 processor instead, and left most of the other features pretty much unchanged. 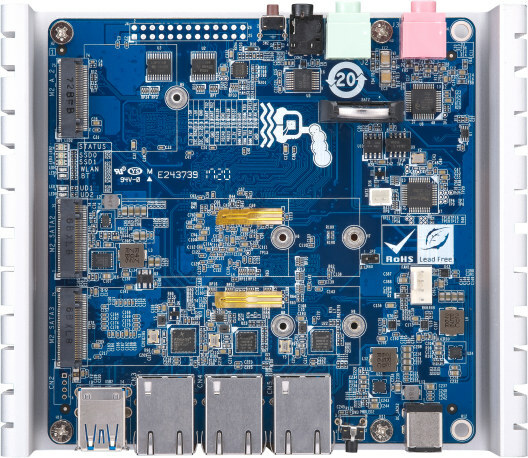 The board runs QTS Lite 4.3.3 embedded Linux operating system, supports features like Wake on LAN, scheduled power on/off, and automatic power on after power recovery. Annapurna Labs does not appear to be the kind of company that release SoC documentation publicly, and I really wonder why they even bothered to setup a website. They (or somebody else) did add support to Alpine SoCs in Linux 4.6, but I’d still assume you’d have to relies on QNAP for the OS and low level software, and just take care of the application on top, praying the lower level feature(s) you need is/are well supported. Qboat Sunny ships with an Ethernet cable, a quick installation guide, a 36W AC adapter and power cord, a wall mount kit, an M.2 screw kit, and two M.2 SSD heatsinks. The promo video below explains why you may want to use the board in your (IoT) projects, for example using it instead of public cloud services to save money. The company claims the board is available now at an affordable price. The only thing is I’ve not been able to find the price… At CES 2017, there was talk about a $100 to $120 with the Intel version. [Update: MSRP is $169/€159]. More details may be found on the product page. It’s a very nice chip family. I don’t know what exactly happened that stalled the upstream contribution process, but I’m quite optimistic that it will be fully supported in the future. Wow, this board ticks all the checkboxes. If that price ends up being as affordable as they say, I can see this becoming pretty popular. It is not the cheap price but strong software support that matters and several reviews on Amazon do not speak well of Qnap servers support. Hmm, aren’t Qnap mainly competing with SolidRun’s ClearFog here? That heatsink stands for a case too. Finally a board with extremely strong IO, 3 gigabit lan, 2 sata slots, 2 3.1 USB. This is like a distant fantasy in a world flooded with low IO A53 boards. Qnap and Synology are both well regarded in the NAS segment so the performance for a NAS will be there. Most benchmarks on the Annapurna processors are also good, putting them neck to neck with Intel chips in the NAS market. Software remains a question mark. Qnap is a complete unknown in this segment of the market. The price is on the higher side, you can buy an Apollo lake NUC for $149. But the NUC only has one sata slot and one Ethernet port. But the NUC only has one sata slot and one Ethernet port. So you better take an EspressoBin for 50 bucks? 3 Ethernet ports (who cares that they’ve to share bandwidth upstream? ), one really fast SATA 3.0 port, one mPCIe port where you can throw an ASM106x (2 SATA ports) or a Marvell 88SE9215 (4 SATA ports) at. With spinning rust as NAS fast enough anyway since bottlenecked by Gigabit Ethernet. Currently with this QNAP offer you’re limited to a closed source firmware but if @Arnd is right this might change even faster than Marvell/GlobalScale changing their attitude and starting to take care about open source communities trying to support their products. I know, just wanted to point out that there exists more than one option in between boring Raspberry Pis and Intel NUCs for ‘small and energy efficient NAS thingie’. IMO the AL-314 is already overkill for this (AFAIK more than 1 10GbE NIC integrated) and I would want to have normal SATA ports on something like this. Yeah, mechanical converters for ‘SATA on M.2’ to SATA exist, I even use them but here I wonder why they used M.2 Key M (allows for SATA and/or PCIe x4 but only used for PCIe SSDs in the wild) instead of Key B (SATA). I mean if it’s really Key M on this board with only SATA pins connected… then I’m encouraged to buy the wrong storage (M key only NVMe/PCIe SSDs that won’t work). Well, the switch there is said to fully support DSA and should come up in disconnected state so in fact you should be able to use the 3 ports on the switch as real NICs. But unfortunately they’ve to share bandwidth since RGMII has been used instead of SGMII (2.5GbE). Anyway, I assume it’s as usual all about use case. For a router multiple NICs are preferred but if it’s just about some NAS box idling around and processing IoT sensor data (as QNAP marketing tells us) then a way cheaper EspressoBin should do the job. Actually, the SSD slots are B key, however the 2230 slot is M key, which makes no sense at all. Apparently I got the M.2 slots wrong (sorry about that, I don’t normally mess this stuff up), QNAP’s spec is correct, but that doesn’t really make sense for the SSDs, as only SATA drives is supported. The A-key slot also makes little sense, as most M.2 Wi-Fi modules are E-key or A and E key, but not many are A-key only.